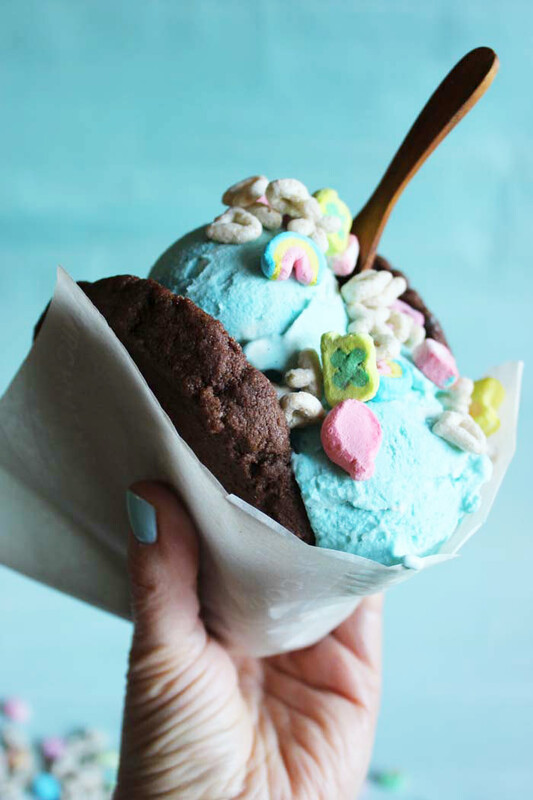 A little blue ice cream, a few lucky charms, and cookies make up this super-fun ice cream sandwich, taco style! 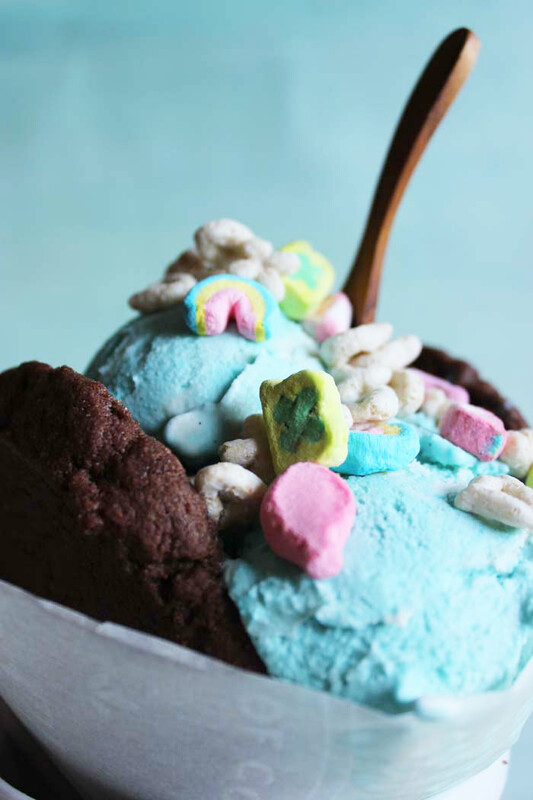 I love this chocolate cookie recipe and vanilla ice cream combo, and the lucky charms add a fun crunch. 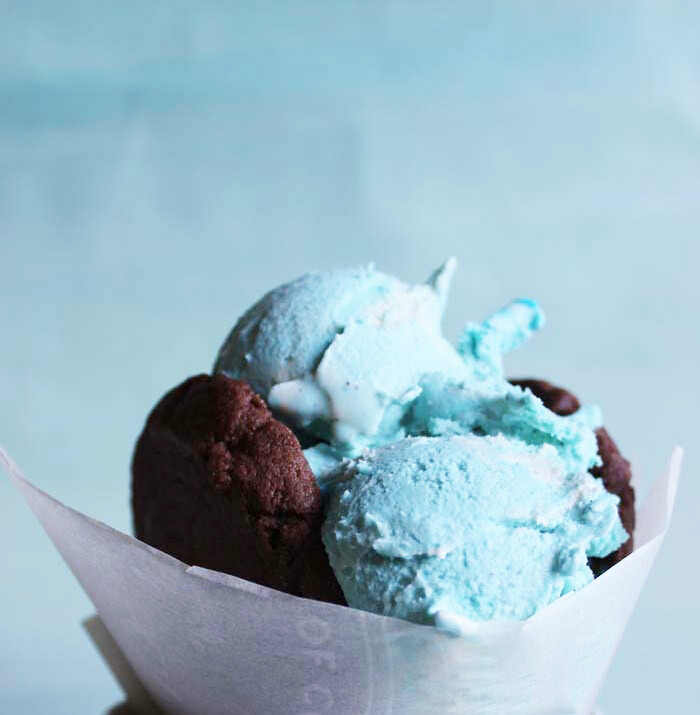 Make the ice cream blue, and all of a sudden, it's a visual ice cream dream! The vanilla ice cream recipe is home made, so everything is from scratch making it just that much more delicious! 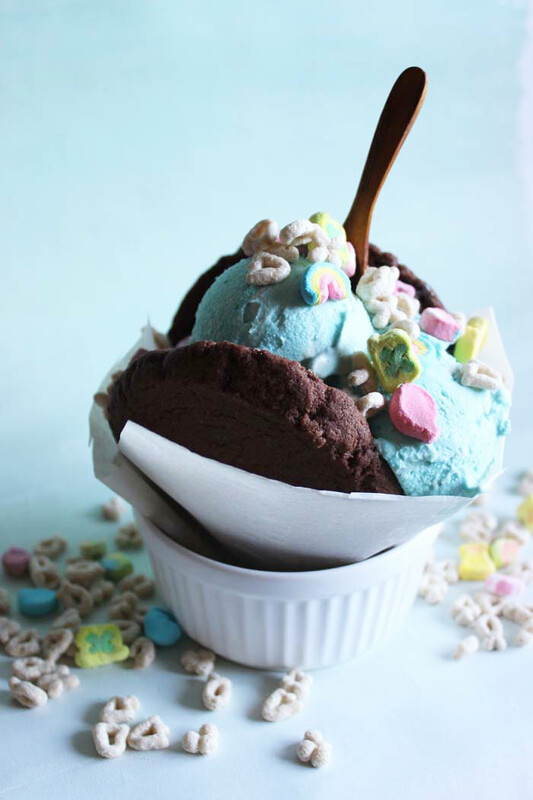 This is one of our favorite ice cream recipes. A little simpler than the custard-style, but still packed with a creamy base and lots of flavour! We also make ours lactose-free but you can make it using regular milk of course! 24 hours before you wish to make your ice cream. Place the freezer bowl in freezer. In a medium bowl, use a hand mixer on low speed or whisk to combine the milk, sugar and salt until the sugar is dissolved. Stir in the heavy cream and vanilla (and optional food colouring). Stir in the heavy cream and vanilla. Cover and refrigerate 1 to 2 hours, or overnight. Turn on the ice cream maker first (very important), and then pour the mixture into the frozen freezer bowl and let mix until thickened, about 15 to 20 minutes. The ice cream will have a soft, creamy texture. If a firmer consistency is desired, transfer the ice cream to an airtight container and place in freezer for about 2 hours. Remove from freezer about 15 minutes before serving. For this recipe, we wanted a harder ice cream so froze the ice cream for a few hours. These are actually two very large cookies placed together in a bowl to look like a taco. Makes 6 large cookies. Or three cookie tacos. Preheat oven to 350F. Combine the cocoa powder, flour baking powder, salt and espresso powder in a bowl. Whisk to blend. Set aside. Put the butter into the bowl and mix using a mixer. Cream until smooth. Gradually add the sugar and mix until creamy. Add the egg, vanilla and mix until combined. Add the dry ingredients and mix until fully incorporated. 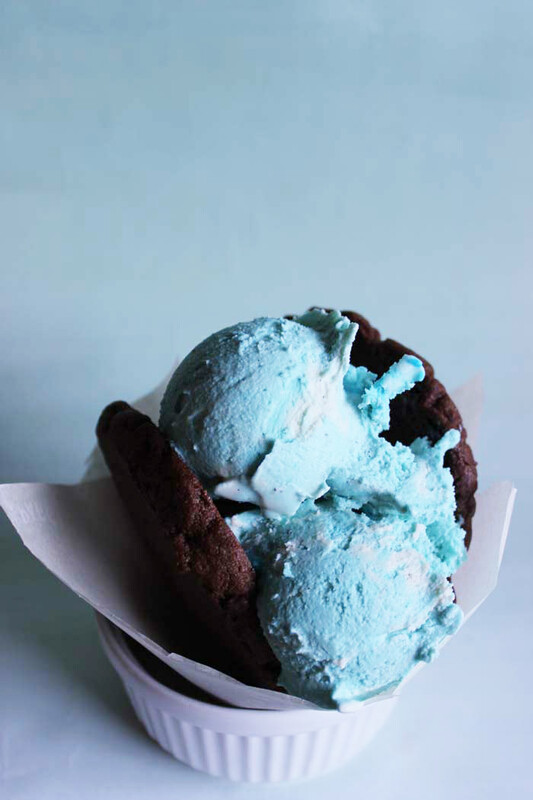 Using a large ice cream scoop, scoop the dough onto a parchment-lined cookie sheet and flatten with the bottom of a glass. To prevent the cup from sticking, dip the cup in flour before pressing it down. Bake in a 350F for about 15 to 20 minutes or until the cookie looks dry but not firm. Let cookies cool before assembling! Place two cookies together to create a "V" or taco shape in a bowl or parchment paper. Using a large ice cream scoop, scoop about 3 scoops of ice cream into the "V". 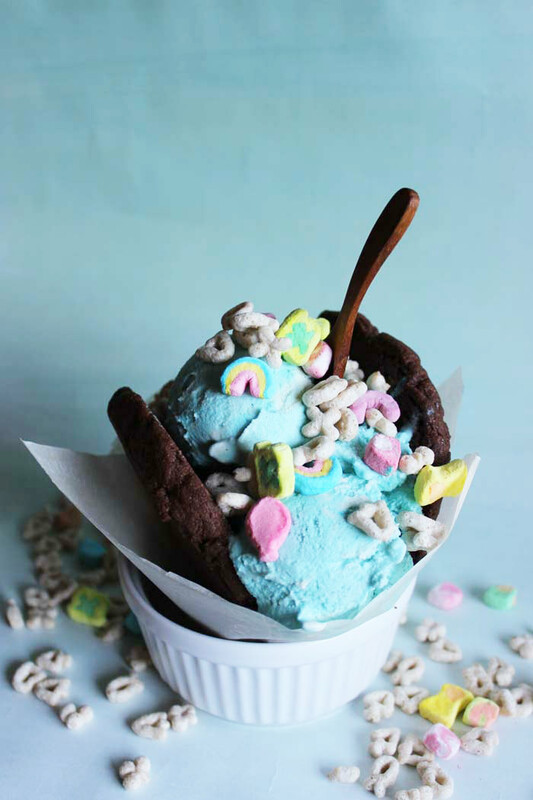 Top with a few sprinkles of lucky charms, grab a spoon and enjoy!